REA's Commercial Driver LicenseTest Prep Puts You in the Driver's Seat! Updated 5th Edition Looking to get your CDL and start a new and profitable career? REA can get you headed in the right direction! Commercial drivers are needed across the country, and a high score on the CDL improves your chances for landing the job you want. This updated fifth edition of our popular test prep offers complete preparation for both the bus and truck driver licensing exams. Based on the current CDL exams, REA's Commercial Driver Licensetest prep contains everything you need to know to get a high score.Focused, easy-to-follow review chapters cover all the topics tested on the exams, including: General Knowledge and Skills Passenger Transport Air Brakes Combination Vehicles Hazardous Materials Tankers Doubles/Triples Checklists, diagrams, and definitions of must-know terms help reinforce your knowledge and skills while you study. This complete CDL test prep package also includes up-to-date information on the Commercial Motor Vehicle Act, Rules, and Licensing, so you'll be well informed on the rules of the road! 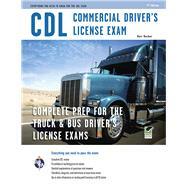 The book features eight practice tests that cover the entire scope of the CDL exams. Each test comes complete with detailed answer explanations. Unlike other test preps, we don't just say which answers are right, we explain why the other choices are wrong, and that gives you an advantage on test day! REA's Commercial Driver Licensetest prep is a must for anyone preparing for this career-building exam! we’ve organized this book in order to make your studying as easy—and effective—as possible. and the latest requirements for the various sections of the test. You’ll find that this book is divided into easy-to-use sections. including the Exemptions, the various tests, and Safety Act rules. be included in other state tests over time. You might as well be prepared. required for the actual Road Test. confidence and enable to approach the test with a positive and relaxed attitude. Good luck on the test, and see you on the open road! will prepare you to take and pass these tests. Commercial Driver Licensing Knowledge Tests in both content and format. Commercial Driver’s License Exam and what material you need to review again. purpose of the Safety Act is to help reduce or prevent truck and bus accidents, deaths, and injuries. the GVWR of the vehicle(s) being towed is in excess of 10,000 pounds. towing a vehicle not in excess of 10,000 pounds GVWR. driver, or is placarded for hazardous materials. Class A – You must be at least 21 years of age. school bus, and cannot transport hazardous material. from officials, and make entries on reports and records. the same or higher class with the proper endorsements accompanies you at all times. within 150 miles of the farm. property, such as certain construction vehicles. - Fire and police vehicles, operated by authorized personnel. - Military vehicles when operated by members of the armed forces on active duty. have to take three or four tests. Each of the seven Knowledge Tests will be scored separately. Motor Vehicles and while transporting cargo of all types. authorized, to drive that particular type of commercial motor vehicle. sections of this book you need to study, see “How to Use This Book” at the end of this chapter. Which class of vehicles will I be licensed to drive? and your license is not restricted for air brakes.